Every Tuesday and Thursday outside the Library from 12:15 – 1 p.m. used to be in Library Plaza. Library Plaza is somewhere I went to faithfully ever since I started college, and it has been a part of Georgia State’s history long before I even stepped foot on this campus. Just make sure you are in the library area Tuesday’s and Thursday’s by 12. I was told this by a student assistant at Georgia State the day I moved into Piedmont North for Summer Success Academy, which also happened to be the first day of my new college life. That’s my first memory of Library Plaza, and even though my first visit to Plaza Tuesdays and Thursdays would not take place until nearly two months later, that quote is still what I remember the most vividly. For the next two months, I would wonder why Plaza was such a big deal, and then the first Tuesday of the fall semester finally arrived. I was shocked. I had never been in an environment like that in my life; it was so many people and so much going on. The music was blaring, people were talking, Phi Beta Sigma were strolling and Jovan Paige was blowing his notable whistle. A sound I would hear quite often for the next two years. There I was, a wide-eyed freshman, soaking it all in and very happy I followed the advice I received two months prior. Now two years later, nearly halfway through the first semester of my junior year, Plaza as I once knew it is gone. Library Plaza or what I like to call now “OG Plaza” is now over in favor of a new plaza, Unity Plaza. Ironically, the reason I was so fascinated by OG Plaza is also the reason it met its demise. According to an article published by The Signal on Sept. 27, Georgia State University Police Department Chief (GSUPD) Carlton Mullis spoke on the dangers of all the new students flooding Georgia State’s central campus and how having all these people in one place at one time could become a problem. He also elaborated on the possibility of a potentially dangerous scenario if an emergency was ever to take place. “We’ve had issues where there’s some speech going on out in the plaza, and if we had a fire alarm or some emergency situation, we couldn’t get those people out,” Mullis said in the article. Yes, safety was the main reason, particularly fire safety, but does that warrant ending a massive piece of Georgia State’s history? Especially when that kind of issue has never happened before, and there is a very faint possibility of it ever? I don’t believe so, too much history and too many memories have taken place in OG Plaza. Plaza was an event; the campus break turned into campus party. It was a place where you were sure to run into your friends and other familiar faces and meet new people at the same time. It was a place where you would see some of the dopest outfits. What made it such a spectacle was no two plazas were the same. 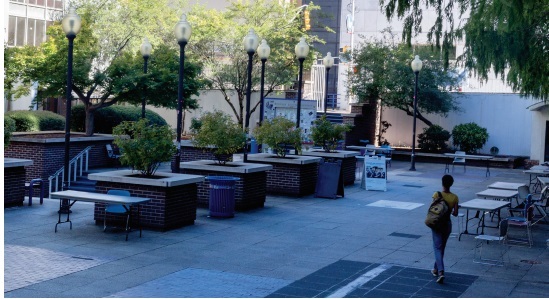 If it wasn’t a Georgia State sponsored Plaza, such as Homecoming or Panther Palooza, it could have been hosted by a student organization. OG Plaza’s music was always fire, and that was because of our incredible wealth of DJs. Plaza featured Georgia State’s best on the 1s and 2s and they always kept plaza entertaining. Whether it was DJ John J, DJ Marc B, or one of the newest campus DJs, the hottest tunes were always blasted at OG Plaza. Why isn’t the new Plaza working? One of the biggest reasons for the failure of the new format of Plaza is that a lot of people do not know where it truly is. Unity Plaza in front of the Student Center is supposed to be the new official location of Plaza, but every Tuesday and Thursday, I hear people confused on whether to go there or Hurt Park. There have been times this year when both locations have hosted events at the same time. There was never any confusion with Library Plaza. There is also the fact that ending Library Plaza has not made that area any less crowded. Students still go there to hang out, meet their friends, or even just to pass the time until their next class. If ending Library Plaza was suppose to reduce the risk from overcrowding and it hasn’t done that, what was the point of it all then? Georgia State has made a mess of one of its best traditions, and that’s not fair to anybody. So how can we make a change? First and foremost we have to come together as a school, and the petition to bring Plaza back was a great start. A fellow student started the petition on ipetition.com and set a goal of 1000 signatures for the cause of bringing OG Plaza back. The petition got halfway to its goal of 560 signatures and 79 comments from students giving reasons why it should be back *. I was very pleased to see someone take the initiative and start the petition, but I was also disappointed in the turnout. With over 32,000 students that go to Georgia State, there is no excuse for why the petition did not reach 1000 signatures. If Georgia State really wants Library Plaza back, they need to support movements like the petition, and make sure the next one reaches its goal. Georgia State made a terrible decision taking away Library Plaza. They pulled the plug on a tradition that current and former students loved, and they are taking away the opportunity for future students to experience that tradition. All the memories and history from OG Plaza can never be replicated at Unity Plaza or Hurt Park. Can y’all link the petition? Although I whined and nagged like every other student, I cannot imagine GSU without library plaza Tuesday and Thursdays!!! I think the reason they shut it down makes perfect sense. I’ve graduated from GSU now but when I was there I always thought if anyone wanted to do something really dumb, like terror level dumb, that would be the place and time to do it. I hate to think that the fear of something like that would change how we live but on the flip side a noon on Tuesday party isn’t really worth taking the safety risk. GSU would have to allocate so many resources to keep that area safe for so many people, not to mention it was a human traffic nightmare. So many other places and times to get wild, noon on Tuesday with safety concerns doesn’t make sense.